Rocks and minerals fascinate children with their interesting shapes and textures. A mineral is a single substance while a rock consists of one or more minerals. The basic types of rocks are igneous, sedimentary and metamorphic. Igneous rocks form from volcanoes and sedimentary rocks form from river, lakes, deserts and oceans. Metamorphic rocks are igneous or sedimentary rocks that were heated, squeezed and turned into a new rock. The calcite mineral in some rocks reacts when an acid touches the sample. Geologists use hydrochloric acid to test rocks. 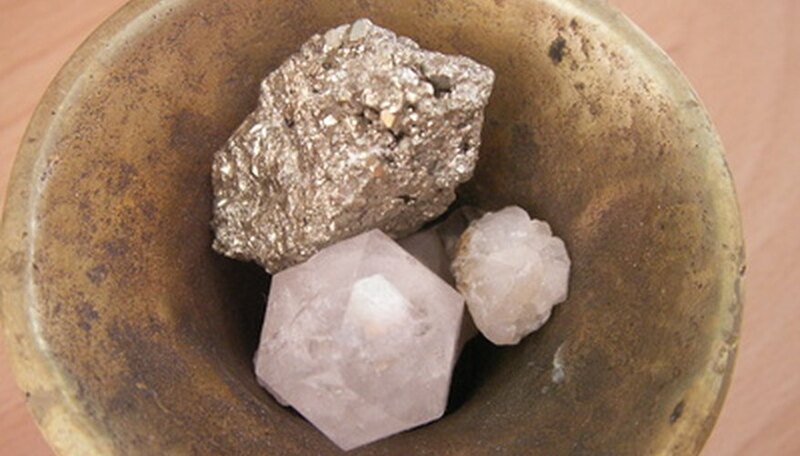 Children can test rocks for calcite using a weaker household acid such as vinegar or lemon juice. Provide them with a hand magnifying glass to examine the rocks since the reaction will be on a smaller scale. Drop the lemon juice or vinegar directly on the rock sample to test it. If bubbles appear, the rock contains calcite. Common sedimentary rocks that are popular for this test are coquina and limestone, which can both contain calcite. The shape of some minerals may be a clue to their identity. A mineral that breaks into to a geometric shape has good cleavage. Galena is a mineral with perfect cubic cleavage. If you hit a sample with a rock hammer, it will break into smaller cubes with each strike. Mica is another mineral with cleavage; however, mica’s cleavage is in only one direction and the mineral forms in thin sheets. Minerals that do not break into geometric shapes when struck will fracture instead. Quartz, the most common mineral, will fracture. To test a hard sample, sit a towel on the ground or on a hard surface. Place the sample on the towel and cover the sample with a second towel. Hit the sample with a hammer and examine the sample pieces for a geometric shape. Children should wear safety goggles during this experiment. Geologists classify volcanic rocks as either intrusive or extrusive. Intrusive igneous rocks form below the ground surface when the magma intrudes, or squeezes, into cracks or openings in the rock extending from the magma chamber. Extrusive rocks form from lava after it expels from an erupting volcano. An igneous rock’s texture is often the key to determining if it is intrusive or extrusive. Extrusive igneous rocks have small to no visible mineral crystals due to super fast cooling outside the volcano and the intrusive rocks have medium to large mineral grains from slow cooling underground. Give your child several rock samples such as granite, pegmatite, obsidian and basalt. Let her examine them to identify whether they are intrusive or extrusive rocks. Pumice and scoria are two rocks that look very similar. Children enjoy testing the difference between these two rocks because one sample will float and one sample will sink. Fill a glass with water and give your child one sample of pumice and one sample of scoria. Place each sample in the water. The sample that floats is pumice and the sample that sinks is scoria. How to Tell if a Rock Is a Meteorite? Barnhart, Tracy. "Rock & Mineral Games for Kids." Sciencing, https://sciencing.com/rock-mineral-games-kids-6743096.html. 24 April 2017.